England's Harry Ellis booked his spot in the Open with his win at the Amateur Championship at Sandwich on Saturday. The 21-year-old won the coveted trophy in dramatic fashion, overturning a four-hole deficit with five to play to force a sudden-death play-off against Australia's Dylan Perry. The pair battled it out over the accustomed 36-hole match-play final, and at one point it looked likely Ellis would take control. After 21 holes the 2012 English Amateur Champion was one-up, but quickly lost four holes in succession to put himself three down with 11 holes to play. By the 13th hole of the second round Perry had attained a four-shot cushion, but his nerve seemed to waver down the final-stretch, bogeying the 32nd, 34th, 35th and 36th holes - helping Ellis recover and send the match down extra holes. The first hole was halved, but by the second Perry once again found himself in trouble and it was Ellis who could etch his name on the trophy next to some of Britain's most famous and finest amateur golfers in history. With his victory, Ellis has now secured his place at the 146th Open at Royal Birkdale next month, as well as at both next year's Masters and US Open. "It's unbelievable, I can't believe what I have just done but you should never give up and never give in," said Ellis afterwards. "I just kept giving myself chances down the stretch and luckily played much better than I had all day and somehow it was good enough that we had to go to the 38th hole. "I didn't think I was ever done but I knew the task was getting tougher and tougher, especially after I missed the par on the 13th to go four down with five to play. I cannot believe what happened down the stretch!" "It (The Open) is very soon. Obviously, it's on another links course at Royal Birkdale so we will see how we go. I just want to soak up the experience there and get as much from it as I possibly can. It has always been a dream to play in majors and I get to play in three now." More impressive than his victory is the accolades that come with it. 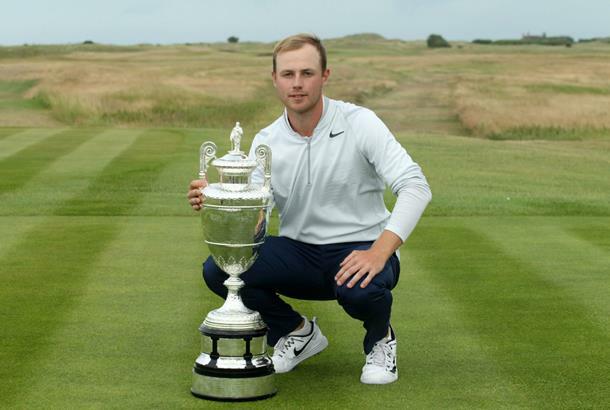 At 21-years old Ellis has followed in the footsteps of Sir Michael Bonallack and Michael Lunt to become the third player in history to win both the English Amateur and The Amateur Championship, and does so as the youngest.